That’s an interesting question. When you exercise, what is your purpose? What do you see in your head? Think about it. Why are you doing what you are doing? “What are your goals?” is a very salesman-ish question, but it is an extremely important one. It impacts everything you should or shouldn’t do in the gym. Is your primary goal to look like the Men’s Health cover guy? Then you should do lots of cardio. Is it to deadlift 500 lbs? Then you shouldn’t do lots of cardio. These are generalizations, but you get the point. Having a goal in mind gives you something definite to work towards and it gives you motivation. If you tell yourself, “My goal is to drop 10 lbs. in the next six weeks,” then you see a finish line and a purpose and, provided you work intelligently towards that goal, you will see a certain amount of success. Even if you only drop 7 lbs. you can take that success and learn from it and hopefully hit your goal 100% the next time. If this is something you haven’t thought about, do this: Think about what you see in your head when you are exercising. When you do a bench press do you think about having chiseled features or do you think about getting up as much weight as you can? 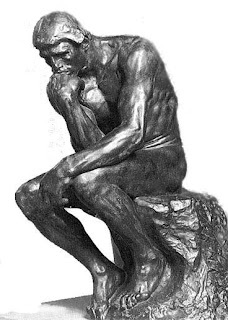 Or do you think about something else? Getting to the bottom of that should help you realize what you really want and then you can take the steps to get there. Hello everyone! I hope you have all been lifting heavy since we have talked last. Don’t try to fool me, either! I can tell! Anyway, I have a few bits of very exciting news for everyone. The first bit is that I am now a published writer! I am the fitness columnist for the Castro Valley Forum and the San Leandro Times. The first column came out today. 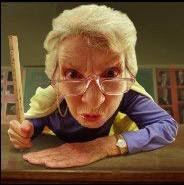 If you go here http://www.castrovalleyforum.com/pdf_viewer.html and go to page 9 you can find my column there. I will be doing one every two weeks. If anyone has any ideas for a column or questions you’d like to see me answer, drop me a line at mitchrothbardttraining@yahoo.com and let me know. Drop me a line just to let me know what you think or just to say hello. You can always post comments here as well. The second bit of good news is that I will now be training clients out of Medina’s Gym in Hayward. If you are interested, please give me a call at 510-754-7113 or email me at mitchrothbardttraining@yahoo.com. We can talk about what you want to get out of the sessions and we’ll get started. I’m really looking forward to it. Medina’s is a good gym. It’s free from a lot of the flashing lights and ear-splitting annoyance of some of the commercial “big-box” gyms out there. They have everything we need and then some. Well, that’s all for now. I’m very excited the way things are going. Hello, everyone! I just wanted to post a quick one today about posture. It’s one of those things that many people just don’t think about. They should. It’s extremely important, especially when you consider the sitting that most of us do for a good portion of the day. Tight hip flexors, jacked up shoulders, etc. People ask about things they can do to help their bad backs and tight shoulders and there are many things that they can and should do. Here’s the thing, though, all of the stuff that trainers or doctors or physical therapists tell everyone to do leads to one place: Better Posture. 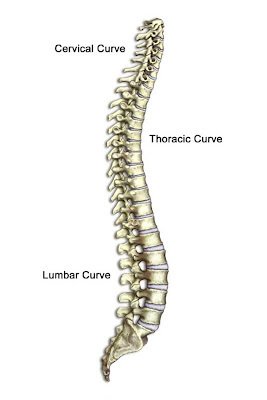 The spine has natural curves in the thoracic and lumbar areas that are there to spread out the pressure that the spine is under. When one curve gets too small or big it puts more pressure on other areas and that’s when problems occur. It can sometimes take a while to notice, but the back is a funny thing. We’ve all heard stories about people throwing out their backs picking up a pen. That didn’t happen because of the pen, it happened because of the cumulative result of a lot of small things that turned into one big thing when someone bent over the wrong way and happened to be picking up a pen. Dr. Stuart McGill, who is considered one of the world’s leading authorities on back problems, has found through his research that, mainly, two kinds of loads lead to back injuries. Very heavy and very light. Why? Heavy we can figure out. (If you can’t, drop me a line.) Light, though, doesn’t make much sense. Or does it? We are used to the thought of injuries occuring because of one event. An anvil fell on our head. We tried to bench 350 lbs. and dropped the bar on our chest. That sort of thing. Many back injuries, though, occur because of the cumulative result of a lot of small things that turned into one big thing. Just like we talked about with the notorious pen incident. What is a big reason for a lot of small spinal issues? You got it! Posture! Work on that and many other things will fall into place. 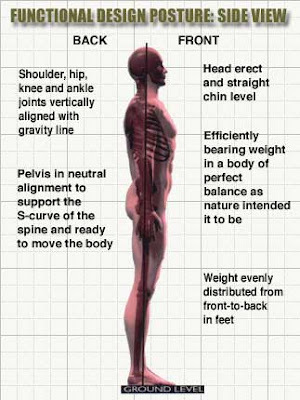 Here is a link to an outstanding article on how to determine the quality of your posture and how to fix the problems you may have. I know that this brings you back to those horrible memories of your third grade teacher yelling at you, but in this case she was right. This and the fact that your hair was a mess! Don’t you have any respect for yourself? In the last few years a few things have really become apparent. 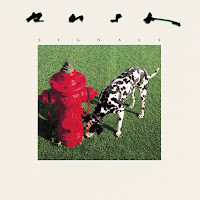 Rush is still the best band in the world, and the fact that dynamic warm-ups are, in many ways, even more important for some people than what is considered the actual workout are two of those realizations. 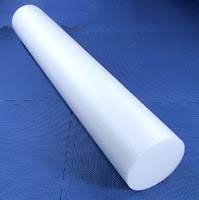 Another is the wonderfulness of foam rolling. Our soft tissue has a few layers, one of those layers is called fascia. This is the connective tissue that is between the skin and the muscle. When everything is working well the fascia can move and stretch freely. Sometimes, however, it develops restrictions which are commonly called knots. These restrictions are small little injuries and they inhibit movement. These knots generally develop gradually. So gradually that we barely notice them until we get tightness and pain in the upper back, knees, shoulders and just about everywhere else. What can we do to prevent this, you may ask. One easy way to help is to listen to Signals on a continuous loop for two days. This might not help you release the knots, but it will help you release your rock n’ roll! Another way to help is to use a foam roller. These are pretty easy to find. You can order them online at performbetter.com or etitefts.com. Just do a search and take a look. If you live in my area, they carry them at Relax the Back and Busy Body, both in Pleasanton. They run about $25. The standard size is about 5′ long and about 6″ around. Something like that. Using one of these things is exactly like giving yourself a massage. It is the kind of thing that hurts like heck at first but as you use it more and more and the knots get healed you start to realize how valuable this thing is. What happens when you use it is that you are causing a Rush of blood to the damaged areas throughout your body. Not that kind of Rush! The blood helps heal the area which in turn, releases the fascial restrictions and you feel and move better. That’s it. The key, like most things, is consistent use. Below I have a video of a good foam rolling sequence. In this video he also uses a tennis ball for some areas, which is a great way to get at some of the smaller, hard to reach spots. At first, though, sticking with the roller for those areas is fine. As you get looser and more used to it, get a tennis ball to use. You’ll feel the difference. Fitness Friday Update, Moving, and By-Tor Rocking The Nation!! 1. We decided to push back the official start of Fitness Friday until April 17th. When we originally planned to start in April we didn’t realize that Easter was the second week in April. Travel plans and things like that can get in people’s way so we decided to start it after that. If you sign up for the full month, however, and can schedule a consultation by the end of this weekend (April 5th) I can give you the equivalent of a free session. The price for the four sessions which, if you don’t already know, include a 30 minute training session with me followed by a 30 minute sports massage, is only $190. That is a $50 savings off of the normal $60 per session price. If you are interested or have any questions call me at 510-754-7113 or email me at mitchrothbardttraining@yahoo.com. Make moving a part of your life. If you see stairs or an escalator, take the stairs. If you can walk instead of drive, walk. Little choices like this add up over the course of a week or a month. We don’t realize how little we really move any more. We sit at computers all day. We sit on the train or in our cars. We sit at home. Get up and move. Go for a walk after dinner. Every half an hour stand up get up from your desk and do a couple of push-ups or stretch those hips flexors that have been getting tight in your chair all day. 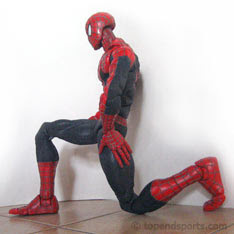 Spidey stays in shape by being active and stretching his hip flexors! When you develop good habits like this, you will find it much easier to be healthy. It really becomes a mind set and, as Tom Venuto says, a belief system in who you are. It is no longer a chore. You simply are now a person that takes the stairs. That mind set shift is how people get healthy and, more importantly, stay healthy. For instance, Rush is a band that certainly believes in it’s ability to rock. Here is undeniable proof.